Cognibox Learning Management Software (LMS) was developed by and for corporate training experts. Our solution derives from a combination of 40 years of expertise, training consulting services and a seasoned team in IT. Cognibox is one of the most advanced solutions for managing training, skills, work procedures and professional qualifications. 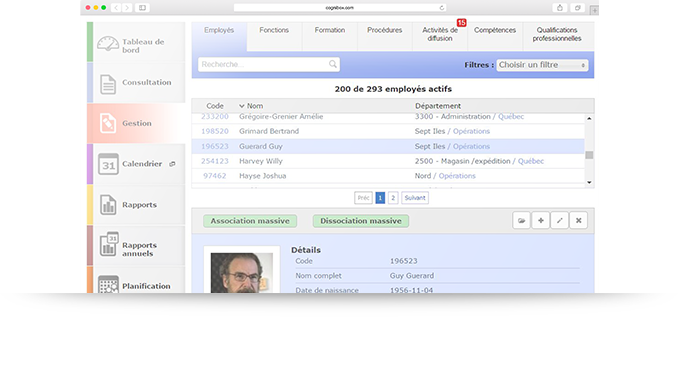 Cognibox LMS is the ultimate tool for monitoring employees, teams and departments compliance based on company or client requirements. Cognibox LMS is a software-as-a-solution application requiring only Web browser capability. Cognibox LMS meets the most exacting criteria in terms of data protection and security. Secure interface connections (standard https) rigorously protect your data. Implementation is coordinated by our corporate training experts and supported by our team of seasoned IT professionals. In addition, client accounts are set up based on the organizational structure specific to each. Each employee in the organization has his or her own overview page detailing all relevant information such as employee number, date of hiring, photograph, e-mail address, etc. The system makes allowance for active/inactive status in an effort to facilitate the management of seasonal workers, students, parental leave or other. Data includes a history of job positions occupied and secondary responsibilities. Each employee job history details training completed, skills acquired, work procedures mastered, as well as vested professional qualifications. What are the benefits for your organization? Requirements by job position or job profile form the backbone of Cognibox LMS. Only clear, coherent descriptions of requirements will enable your organization to target and prioritize needs, and then plan training activities for the upcoming month or year. If need be, the training professionals at Cognibox are poised to assist you as required in defining job profiles. 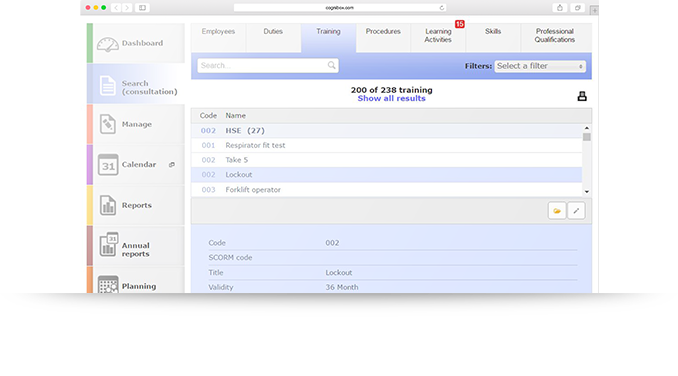 The myriad training catalogue management functionalities provide for both restricted catalogue control and the management of consequential training databases typical of organizations with lengthy operating histories. Intended for both e-learning and classroom training, this module provides for the control of parameters such as temporal validity, training duration, average cost, optimal number of participants, as well as refresher course management. In working environments with respect to which large numbers of work procedures (good manufacturing practices (GMPs)) apply, it is often difficult to ascertain who received which version of procedural training and when. 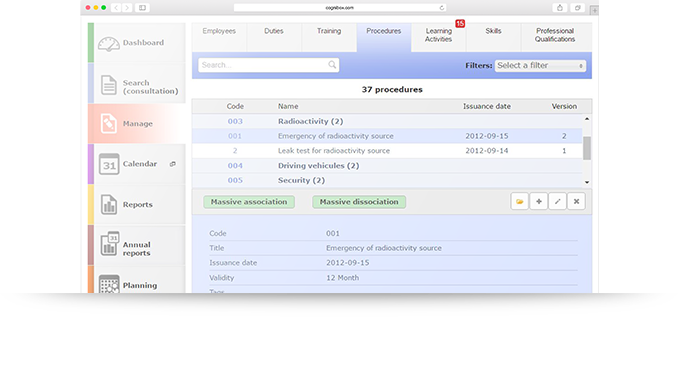 Cognibox LMS makes it possible to manage procedures through specific functionalities such as version control which enables you to schedule refresher training for all employees concerned whenever changes are made to work procedures. 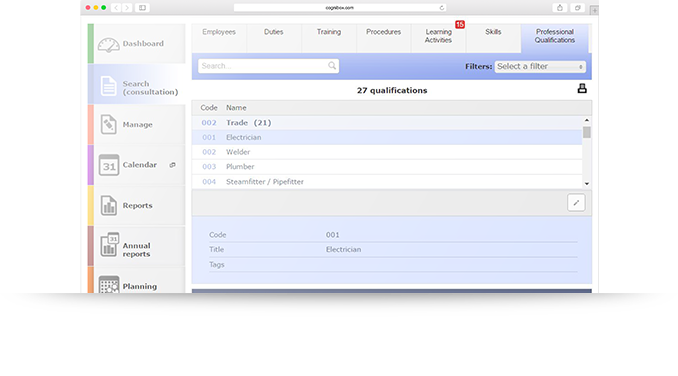 Guarantee regulatory compliance with Cognibox LMS. 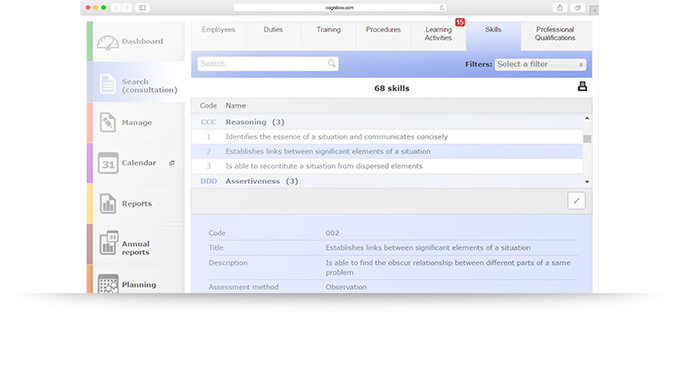 Skills management in Cognibox LMS is as thorough as it is easy to use. The system can manage an unlimited skills inventory and provides managers with the flexibility of establishing the required level of mastery of a skill for a given job position. Inversely, skills can be recognized for employees based on the required level of mastery. Reports generated substantiate any gap between these two parameters. Ever increasing numbers of organizations monitor requisite professional qualifications closely for each job position. Whether it is a matter of a qualification required prior to hiring, diploma, degree, permit or trade certification, Cognibox LMS provides the necessary functionalities for monitoring each. Cognibox LMS supports the daily management of both classroom and e-learning training activities. The intuitive software interface makes it possible to generate virtual classes and invite employees via e-mail to enrol in requisite training. Cognibox LMS meets the SCORM standard for content format and therefore supports levels of interactivity ranging from the simplest to the most complex. 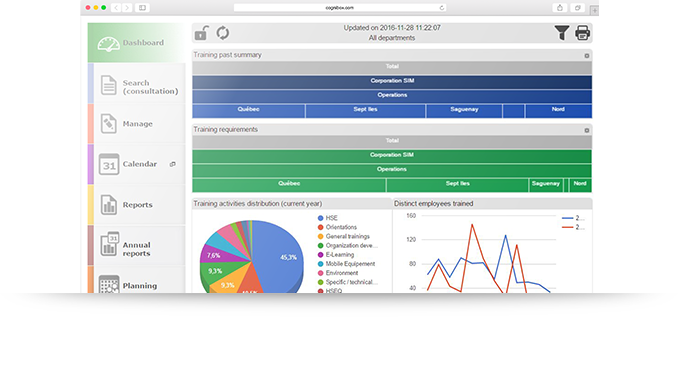 User-friendly dashboard provides for the daily follow-up of performance indicators relating to team training and compliance. The dashboard is customizable based on individual user preferences and screens statistics based on the hierarchical level of users. Screening of viewable data by location, division, department, etc. Calendar display mode groups together all traditional or e-learning activities and procedures to provide you with an overview of activities planned in the upcoming days and weeks. 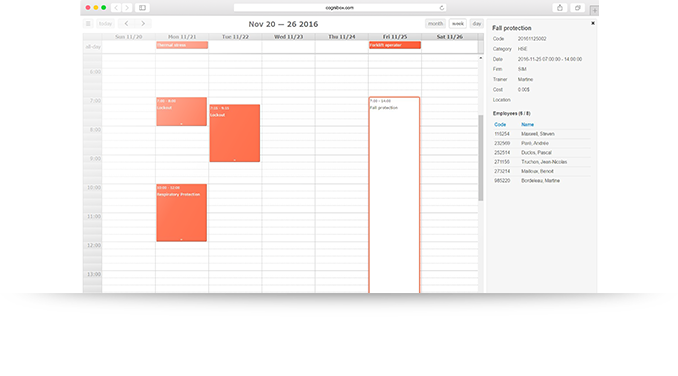 Use the calendar to specify activity session times and manage activities spread out over a number of days. 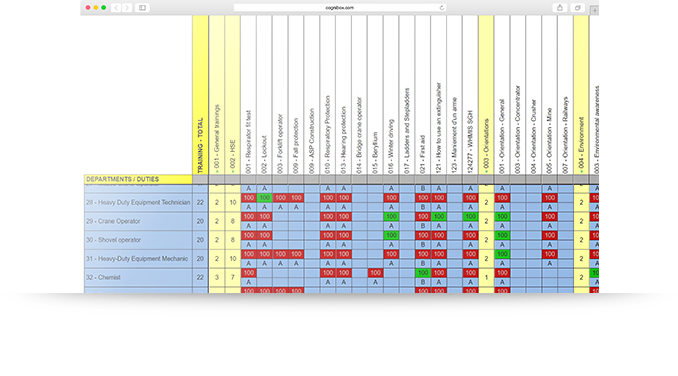 A facet which undoubtedly distinguishes Cognibox LMS from the competition is the vast selection of reports available: individual, department, aggregate. Reports indeed cover levels of compliance with requisite training, refresher training on work procedures, etc. Many are accessible in just one click, whereas others can be custom-built by users and saved for future reuse. All available in PDF or Excel as required. Training cost management is an essential activity for any organization. 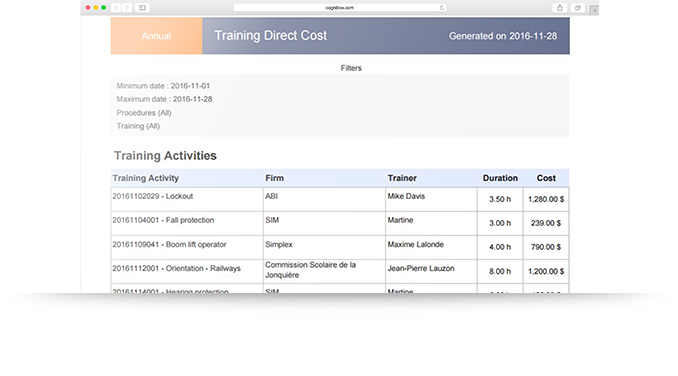 Cognibox LMS allows you to manage and detail all costs relating to the scheduling of training activities, and even attach all supporting documents. Upon request, the system can also display encrypted hourly wages and generate complete reports including costs relating to employees trained. 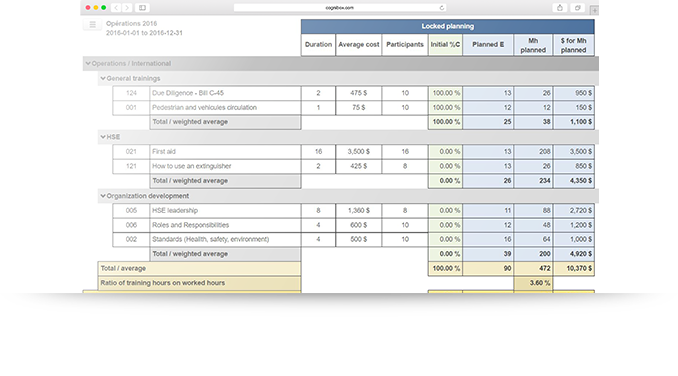 Deliverable as an option with supplemental training, the Cognibox LMS planning module enables you to plan as never before. Basing yourself on measured needs, organizational priorities and budget availability, plan long term training for your organization as a whole or department in particular. In addition, daily indicators follow up on initial planning. This unrivalled market tool was developed by and for field managers. 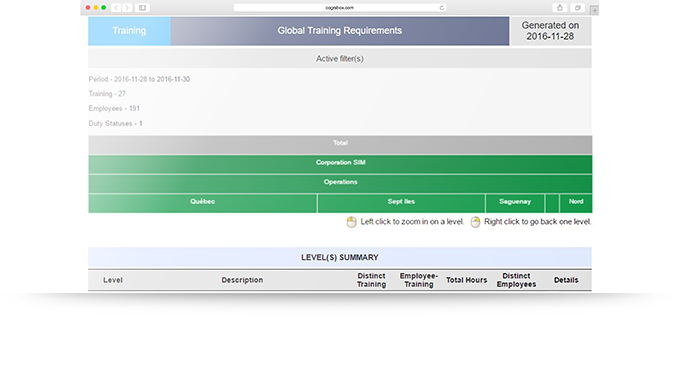 Cognibox LMS is for any company wishing to efficiently manage staff training and skills. It is a unique solution created by company training experts who will advise and guide you throughout the implementation process.